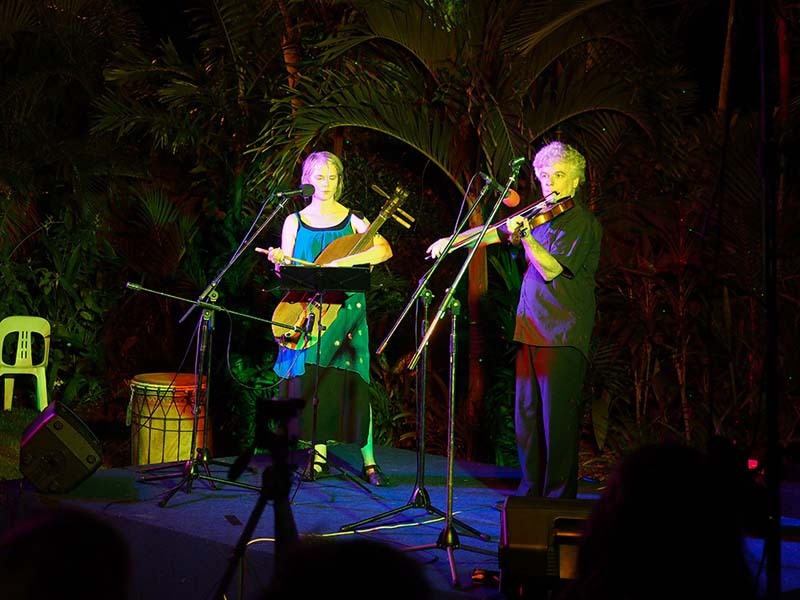 Both members of this unusual duo have been seen at folk festivals in many other formations. Fiddler Mark Richards has been band leader with The Transylvaniacs since 1993 and in-house fiddler with folkloric group Kengugro. Singer Gemma, as well as singing duty in The Transylvaniacs was member of the high profile 90s a cappella group Blindman's Holiday and has explored many other singing styles from early music to salsa. Csángó Hungarians of Transylvania have preserved many elements of a medieval music tradition. Hear their bold, energetic music reflecting the oldest Magyar traditions played on the ütőgardon (a struck and plucked ancient cello), the koboz (a lute) and fiddle. Welcome to the Szek Tanchaz (dance house). Learn the wild Csango dances from the hills of Transylvania. Dances are accompanied by rocking Csango rhythms while Gary Dawson guides you around the dance floor. Learn circle dance tunes from Gyimesi. The style features solo violin with string drum accompaniment and is suitable for beginners as well as more advanced players.